A lastminute glitch just seconds before launch prevented the Tuesday liftoff ofEurope's first polar-orbiting weather satellite, yet another delay for the spacecraft. Thecountdown clock stopped just before a Russian-built Soyuz-2rocket carrying Europe's MetOp-A weather satellite launched spaceward fromthe Central Asian spaceport of Baikonur Cosmodrome at 12:28 p.m. EDT (1628GMT). "Wehad to stop the final countdown a few seconds before launch," said Fran?ois Maroqu?ne, director of sales and marketing for Soyuzlaunch provider Starsem, in a post-scrub statement. "It is impossible to launch today as we only have one launchopportunity per day. A team will analyze the situation and we will know in twoor three hours if it is feasible to launch tomorrow." 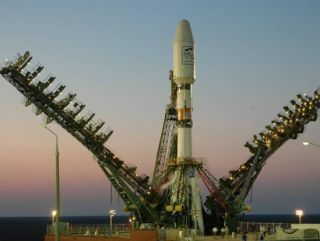 Officials with Russia's Federal Space Agency told the AssociatedPress that technical problems have pushed the MetOp launch to Wednesday at12:28 p.m. EDT (1628 GMT). Tuesday's launch scrub marked the fourth launch attempt this year forMetOp-A, a hefty 8,818-pound (4,000-kilogram) satellite. A telemetryerror prevented a July 19 launch attempt, with fueling issues and incorrectdata scrubbing two earlier attempts. Built by EADS-Astrium, MetOp-A is the second largest Earthobservation satellite constructed in Europe and is expected to be the firstof a polar-orbiting trio of weather-watching spacecraft for the EuropeanOrganisation for the Exploitation of Meteorological Satellites (EUMETSAT).Altogether, the MetOp satellites are expected to serve as the EUMETSAT PolarSystem (EPS), European Space Agency officials said. The MetOp spacecraft carries a suite of sophisticated instrumentsdesigned to monitor Earth weather and aid global forecasting efforts during its15-year design lifetime. The spacecraft also marks the European component of ajoint Earth-watching program with the National Oceanic and AtmosphericAdministration (NOAA) in the U.S.
Associated Press writer Mike Eckel contributed to this report fromMoscow.